THE ongoing Philippine Super Liga Grand Prix parades another exciting batch of imports made up of 10 debutants and two returnees, who put on display not only their talent but also their looks. Spin.ph managed to sit down with some of them and asked about their thoughts on the Philippines, the Filipinos, the Super Liga, and volleyball in general. Spin: How have you been enjoying your stay in the Philippines? A: I love it, I love it. This is home away from home. I like to say it that way, you know, the people are very friendly, the place is beautiful, the weather is great, I love it. Q: How is the team chemistry? A: It’s been great since the first day they received me, they welcomed me, like I was part of their family. I feel like I know them for so long already. It’s crazy, it’s only been a month. Q: What made you decide to play in the Philippines? A: Every time when I ask her (Erica Adachi) what’s going on, then her face blooms. Fans and fans always like her picture and they always talk about how they love her and how she’s so good. And me, what’s going on? And she told me, you won’t believe, this is crazy. The fans here, they love volleyball. And I’m loving it, that’s why I came. I did everything I could to be here with her. You know, I played with her before. I know how she plays, we have a good bonding. 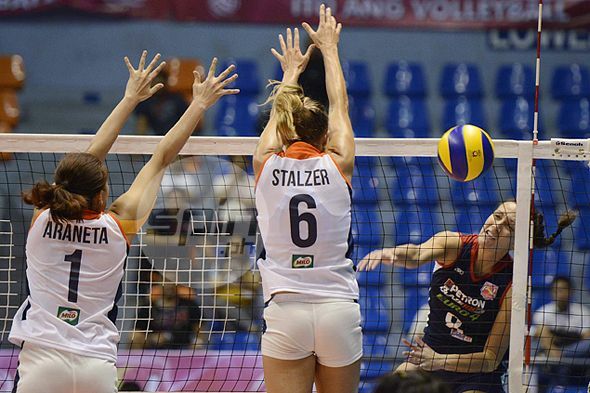 Q: Did it take quite some time for Erica to convince you to play for Petron? A: No, it was just a day (of convincing) when they told me, hey, they want you. I was like, ok whenever you guys need me, I’m just like you know, I wanna go there ‘cause I wanna experience that. I wanna know what it is. I need to see how it is. In Brazil volleyball is huge, but it’s nothing compared to here. You know, I wanted to experience this ‘cause people are so passionate not only the players, but the fans and everyone else. I think it’s gonna be fun. Q: Filipinos are known to be the best fans in the world. Have you experienced the Filipino hospitality/welcome so far? A: It’s crazy ‘cause I’m always with Erica and we go shopping and everyone wants to have pictures with me. They ask me, 'Hey can I have picture with you?' And I’m, 'Yeah, do you know me?' 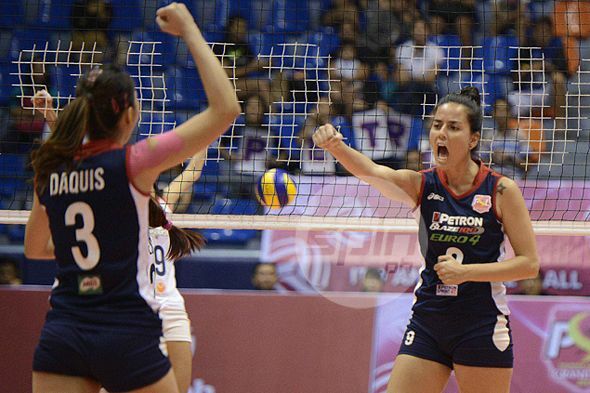 And they will say, 'Yeah you’re Rupia playing for Petron.' That’s crazy, a lot of selfies already. Q: The Philippines is the world’s social media capital. Did your followers increase since you came here? A: I left Brazil with 500 followers (on Instagram), and now I have almost a thousand. It’s just a month and now I don’t know what to expect anymore. Q: What were the first Filipino words you learned? A: ‘Ganda’ means pretty. I also learned a gay term ‘chaka’ which means ugly, and’ tara!’ ‘tara!’ which means let’s go! Spin: It’s your second time to be here in the Philippines with Petron. What has changed since the first time you were here late last year? A: Everything is the same, I’m feeling at home. First time I had difficulty getting to know the girls and know everybody, (but) Aby (Marano) and Rachel (Daquis), they were really cool, so it was easy to get to know everybody. It seems I hadn’t been away from here. 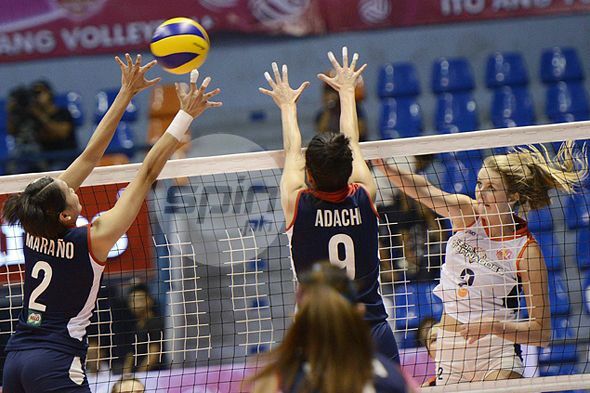 Q: Petron played in the Asian Women’s Club Volleyball Championship prior to PSL. How big of an advantage is that for the team? A: This time we are tighter (than before). We had team bonding, so that’s good for us instead of just having a week of practice before PSL. That’s going to be different for us. Everybody already knows each other, and (new import) Rupia (Inck) already know the girls. I think that’s our edge. 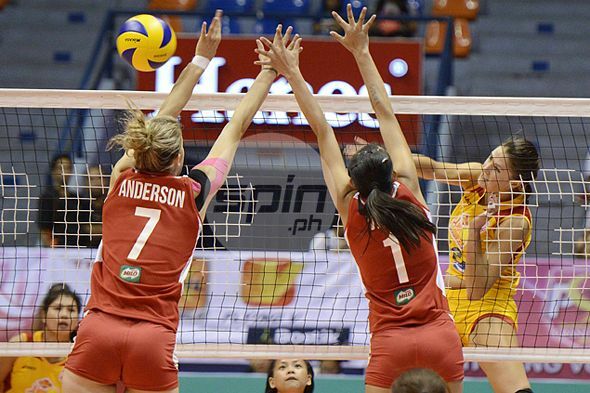 Q: What are your expectations for this year’s Super Liga? A: I think this is going to be really competitive. 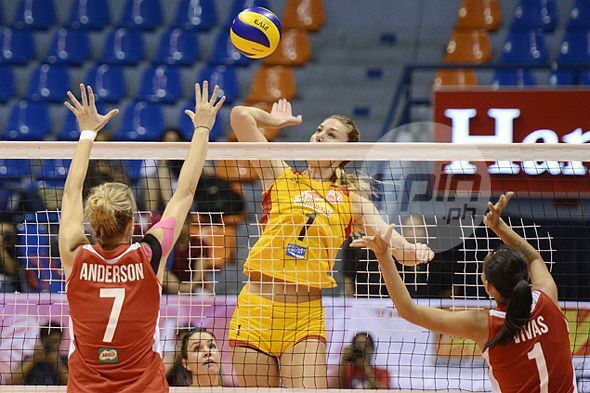 Foton has a great lineup, so I think this is going to be harder, and I’m looking forward of playing for the PSL. Spin: How is the team chemistry? A: It’s really good. We’re looking for every opportunity that we can to bond more, and then we’re really working in practice for (team) chemistry and getting the flow of the game, getting used to the game. Since I’m new (with the team), I’m getting used to connecting with the setters and talking to the passers. Q: Have you been enjoying your stay in the Philippines? A: It’s been great. Manila is a lot bigger than what I’m used to. I’m from Omaha, Nebraska, which is a lot smaller, but I also got a chance to go to the beach on Sunday and I think that’s a nice representation of the country. A: It’s my first playing job and I’m glad it’s the Philippines. I found out that it has really nice people and a good location and everyone has been so welcoming. I heard this about another player, who went to my college, she’s Emily Brown. She told me great things about the Philippines that’s why I’m here. A: Yes (a lot of selfies), everywhere. I get pointed out in the streets, they say, that’s the American, that’s an import. Yes, there’s so many selfies. Everyone wants to have a picture. It’s crazy. It feels like we’re rock stars here. She (Brown) told me there’s a lot of it (selfies), but it’s nothing compared to what I imagined. But any attention I get also reflects to the team. Q: The Philippines is the world’s social media capital. Did your followers increased since you came here? A: Yes, I’m getting a lot of friend requests and I actually have a fan page that I’m hoping I can separate my family from my fans cause I did that in college. But I also like to interact with my fans and let them see the inside with what we’re doing with RC Cola. So I think social media is a good way to show them what’s happening inside the team. Q: What are your expectations for the conference? A: I’m the youngest one in the team, 22, just out of college, so I’m expecting to bring a new young, energy like a bold mentality. We want to win, and also I’m hoping to bring some physicality with my height. I’m really excited cause hitting is my number one skill. Spin: You were the last to arrive, just a day before the conference started. How are youadjusting to your new team? A: Like any player we need a couple of days to get to know the different players, how are they going to play. But I’ve experienced playing with players all over the world and I don’t think it will be too difficult for me. I’ve not yet seen the Filipinos play, but I’ve played with a lot of Asian teams specifically Japanese, and I think the Filipinos are more of that defensive type of players. Smaller so defending a lot. Q: What are your expectations for the PSL? A: Honestly, I know we have a really good team so I’m expecting to win this championship. Q: You’re one of the most awaited imports, having a long list of international tournaments played. What do you think will be your contribution to the team? A: I think (I will bring) energy (to the team) ‘cause I play with so much energy and a lot of passion. And also knowledge because of where I played, I learned a lot of things, and I’m hoping to teach and bring that to the team so that I can help elevate our level of play. Q: What do you look forward to in your stay here in the Philippines? A: Besides volleyball, I’m looking forward to getting out to the islands, snorkeling, scuba diving, just checking out what the Philippines is just like outside of the metro area, cause I see it’s beautiful. I know there’s volcanoes and islands and gorgeous beaches. I’m excited to see what the Philippines has to offer. A: I actually know (former PSL imports) Emily Brown, Cristy Jaeckel, and Alaina Bergsma and they told me the fans are really passionate. They love to take pictures and social media and they are really, really nice. A: I know thank you is ‘salamat,’ but I’m excited to learn more little by little. Spin: It’s your first time to play here in the Philippines. What are you looking forward to in your stay? A: I’m looking forward to winning and meeting all the Filipino volleyball fans and exploring Manila more and playing in front of the crowd which will be fun. My teammates are great and I’m expecting us to do well. A: Right now, we’re still getting to know each other. The girls have played together for a while, so Lindsay (Stalzer) and I are getting to know the girls. So it really helps to get to know them outside the court ‘cause it really helps the team chemistry on the court. A: I’ve heard Filipinos are really into volleyball. It’s really growing here so that was the main thing I heard. When I was deciding where to play, they were like, it’s really getting big in the Philippines, and it’s really fun to play there, so I do expect there to be a big crowd and a big following, and that makes us play better, when there’s energy in the gym, you just get inspired to play better. A: No. Is that gonna start? That hasn’t happened yet. People definitely are staring, (maybe) they’re confused, (and asking themselves) why is this girl here? A: ‘Salamat,’ ‘ Mabuhay.’ What is that welcome? ‘Hinda?’ How do you say no? I don’t know that word yet. Spin: Why did you decide to come back? A: Why would I not want to come back? I had such a good time last year. I had fun playing volleyball, I had fun seeing the Philippines and the culture, and obviously making friends here. It was such a good time I had to come back. A: It will be tough because we only have few practices together, but it’s also a tribute to the Filipino people. They have been so welcoming and instantly like friends, so I think we’ll be fine. Q: You played for Cignal last year but you failed to bring your team to the championship. Is there an added motivation for you to make it to the finals with your new team? A: We just missed out last year. (We) had a few games that didn’t go our way, but this year we had a pretty strong team and I think we have a chance to be in the top two and that’s our goal. Q: How is your first year different from this one? A: It’s amazing, everyone is so friendly. I haven’t had any issues that I had in Germany or in the US. it’s unbelievable. A: Amazing. I was shocked. Usually in the US, it takes a pretty long time to get accustomed to your team, and it wasn’t like that at all here. First practice it was a little shaky, but not in our last scrimmage that we had, unbelievable. We all just clicked. It was good volleyball, and I was shocked. Q: What are your expectations on the PSL? A: I haven’t seen any other teams so I don’t know what to compare to, but I think we’re pretty legit so we will see. I’m just looking forward to the crowd. I’ve heard your fans are unbelievable, and I’m so excited for them, and just hopefully win the championship for them. A: Just the guys that we played so far. But everyone is so friendly. When we walk in the street everyone is like, ‘Hey how are you doing?’ so I’m like, ‘Hey, what’s up?’ I haven’t had that in a while. Q: How have you been enjoying your stay in the Philippines? A: It’s been wonderful. It’s 10,000 percent more than what I expected. Absolutely the people are amazing. When you walk down the street and people look in your eyes, and say hello, and that doesn’t happen especially in Los Angeles, California. A: My whole team, Philips Gold, the girls are so welcoming. The minute I entered the gym, they introduced themselves, they made me feel like I’m a Filipino, and that is what every import wants to feel. They want to feel they’re part of the family and we’re trying to be one so that’s been great. A: Absolutely. (I’m getting a rock star treatment) it’s wonderful. You almost feel like you don’t deserve it ‘cause you’re just like a normal person, but everyone here looks at you like you’re someone special and you almost want to be a better version of yourself because of that. And that’s the beauty of it. I think that’s why a lot of imports want to come here because the Filipino people bring out the best in them, they make them want to be better, maybe they are so when they come here (they think) I can do this. This is how I want to live like they see me. A: When I came here I have so many (Facebook friend) requests, but I don’t know who to accept because in the United States it’s very different, you don’t accept everyone. It’s not that we don’t like the people here, it’s just you want to keep your privacy. So if someone leaves me a message on Instagram or Facebook and say, hi I’m a fan and I love Philips Gold, then I will accept. But if they just say I want to be your friend (I won’t accept). I don’t know you. I’m still a person. I’m not just an image. If you want to be my friend say something. That’s my point of view. A: ‘Salamat’ is thank you. A: I’ve loved it I’ve traveled around Europe and Mexico. I think this is a lot like Mexican people, super friendly. Everyone’s so welcoming. A: Team chemistry, it was so great. Coming in the first day, obviously we were a little bit nervous. I just traveled 15 hours to get here, and the first practice was so easy everyone just meshed really well. Everyone introduced themselves and we’re just genuinely excited to be here and I felt the exact same way. Q: What are your expectations in the tournament? A: I have high expectations from our team just because I feel we can be really, really good. I’m just here two weeks (three weeks now), but I just see good things from our coaching staff and from our players as well. A: ‘Salamat po’ with this (pabebe) wave. ‘Ate’ is older sister, that’s the two that I know for sure. And you guys speak a lot of Spanish words like ‘cuchara,’ ‘derecha.’ I just hear a bunch of Spanish words. I know Spanish. And your numbers are also spoken in Spanish and the days ‘Lunes,’ ‘Martes,’ Miyerkules. It’s funny cause when they start talking I don’t know what they’re saying, but then I hear some words and I’m like o, maybe I do. A: The Philippines has been super welcoming really, really easy to come around. So far it’s been great this season, we have so many fun practices with good intensity, good energy, I’m really excited for the season. A: Team chemistry is great. I’ve been telling them this is the first time I’ve come and I’m not kidding the very first practice I was like, this is so enjoyable. The girls are so great, they’re so easy to step right on the team with, we get right on easily. All the girls are awesome. I’m still trying to get adjusted, but I’m telling you, it’s been the easiest adjustment I’ve ever had. Q: This is not your first time to play internationally, but is your stint here in the Philippines any different? A: This is my third time. My first season in Denmark and last year my second season in France. Every experience is new, but this experience is pretty darn cool. A: Yeah, this past Sunday when we were playing a couple of teams, and after the game they were all asking for selfies. But I want selfies too, so it’s perfect. A: I don’t know. I haven’t looked at my Twitter, but I have Instagram and Facebook which increased a lot which is exciting. Everyone loves that feeling, but I’m trying not to get too concerned with that. It’s a cool privilege I guess and a lot of people like that. It’s a really cool atmosphere in here. 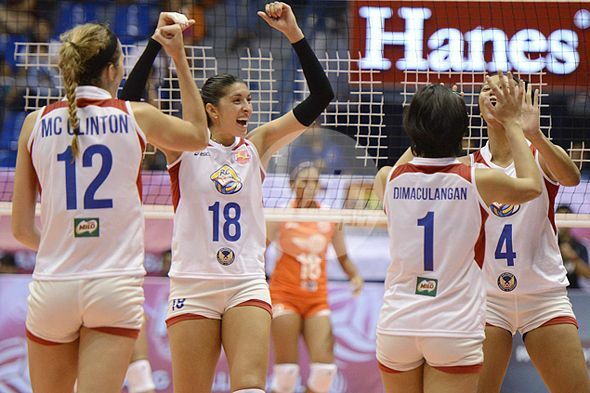 Q: Cignal has been a back-to-back runner-up at the start of the PSL. But in the past conferences the HD Spikers were out of the radar. 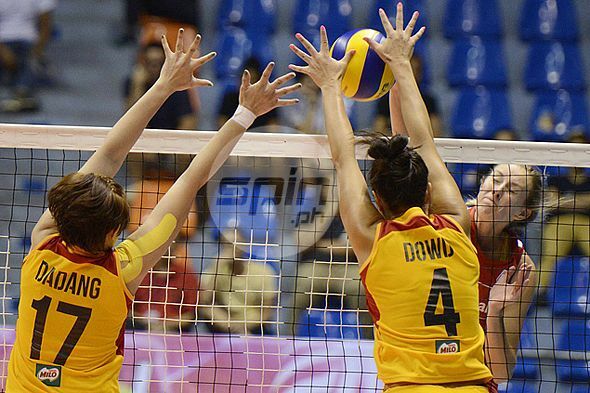 Do you think this will be the year for Cignal? A: Sure thing we’re going to the finals. That’s why I’m here for, a championship, no doubt about it. The way our team works and our practices are held, we’re going to the finals. It’s really been constructive, good energy, so I’m really confident. A: It’s been very good. The girls have been so nice to us from the start and I think we get along really well. A: We’ve been here for about a month now. The chemistry has been good. It’s been nice playing with the team. Q: Have you adjusted to the style of Filipino volleyball? A: It hasn’t been very hard. I’m trying to find my position. I played all position. 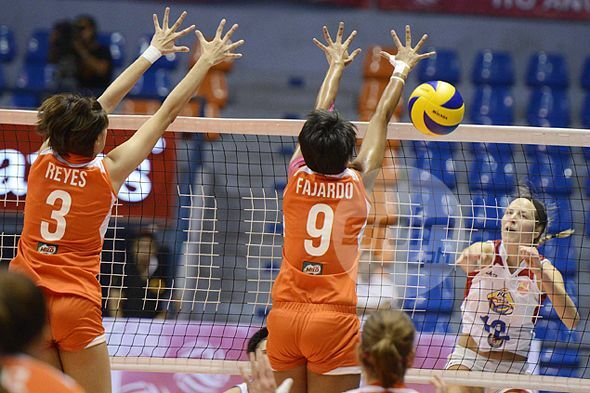 We’ve been trying to see what works the best for the Meralco team. A: I’m just hoping that we’re going to be good additions to the team and we can help the team achieve the best position in the tournament. But of course I recognize that the other teams in the tournament are good and the imports are very strong. We are hopeful, but we’ll train hard and we’ll see for the rest of the season. A: ‘Kumusta ka?’ ‘Saan ka pupupunta?’ ‘ Masarap ang galunggong.’ And they taught me a tongue twister, ‘Ang relo ni Leroy ay Rolex,’ but I’m not fast yet. I’m practicing. A: I think it’s been really good so far. It was hard for us at first adjusting to the whole game and just the atmosphere and everything, but we’re coming along I think. Q: Is this your first time to play internationally or in Asia, and how has it been? A: Yes, first time in Asia. It’s been really awesome. I really like the environment, the culture everyone is so friendly. The Filipino people have really been welcoming and really supportive of us, so that’s really awesome. 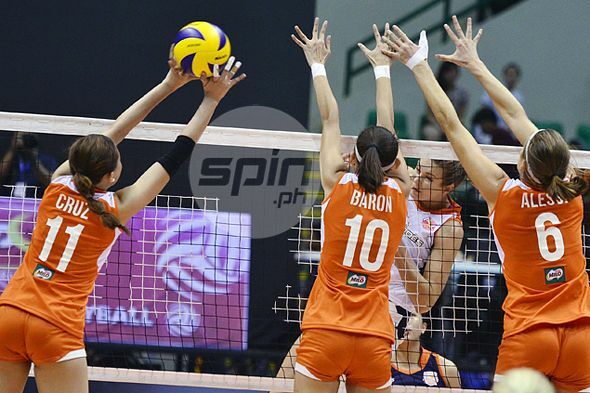 Q: Last year, Meralco, formerly Generika Life Savers, lost to Petron in the title match and they are out to get that elusive crown. Does that motivate you win the championship? A: Yeah we’re a little bit angry. I can’t say ‘cause I’m not here last year, but my team is really in for the win. A: Honestly I couldn’t even tell you. I have really bad memory.